The most rewarding day to honor the best woman in our life is here. Indeed, this superwoman presents to every child and adult’s life makeup the truest hero any time of day. We are who we are today because of her. She’s someone who never fails to give, to offer, to share and even to ask – to ask for a little of our time for her. She has always the generous amount of patience, love, kindness and understanding for us. The lady who shaped us to be the best man and woman we can be in life. A refuge when the world turns its back on us. Indeed, our MOM is the most amazing person we can have! 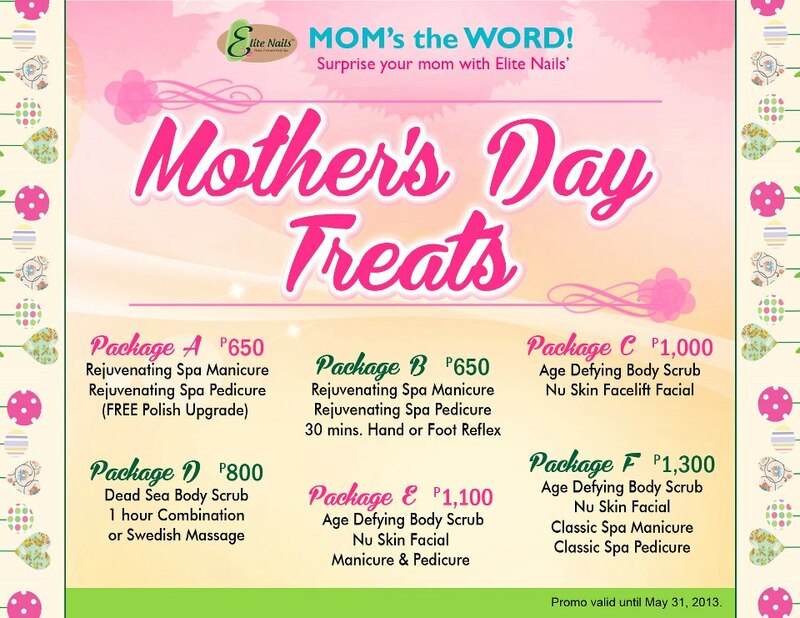 This Mother’s Day, give your Mom the sweetest gift; treat her to a spa for one awesome experience! Elite Nails’ Mother’s Day offers will surely allow every mom to relax, unwind and be pampered from head to toe. This is the best time to spoil her because she deserves it so much! 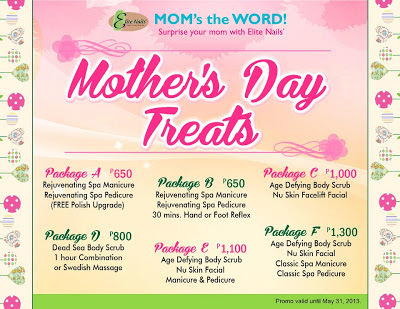 Checkout the packages below and head over to Elite Nails Spa to get your mom’s pampering started. Note: To save time, you may call the branch near you to reserve you an appointment.